A huge lake 20 miles in diameter has been spotted on the dwarf planet's surface. 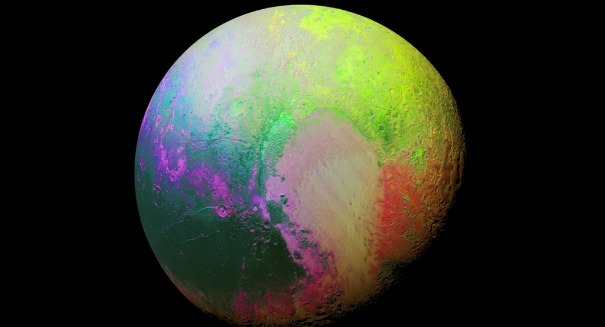 New data from NASA’s New Horizons spacecraft indicates that there may be lakes on the surface of the dwarf planet. The lakes, made of nitrogen, may freeze and thaw on a periodic basis. Water lakes would never unfreeze on frigid Pluto, but liquid nitrogen would be possible during periods of warmth, according to a NASA statement. Pluto is on a 248-year orbit around the sun, and since it has a big axial tilt — 120 degrees compared to Earth’s 23 degrees — lots of the dwarf planet get direct sunlight. Pluto also wobbles, which can result in long-term climate cycles, far longer than anything on Earth. Scientists say that Pluto is in an intermediate phase between climate extremes, with temperatures about minus-400 degrees Fahrenheit. The last climate peak is believed to have happend less than 1 million years ago. During a high-temperature climate extreme phase, its atmospheric pressure could be up to 10,000 times higher than it is now. At that level, nitrogen could turn to liquid and form lakes on its surface. New Horizons shows that could definitely be the case based on images taken from its flyby last July that show features that appear to have been carved by some sort of liquid. One frozen lake appears to be about 20 miles across.